The last few years have been far from easy and there have been times when I have wondered what God was doing or why He was allowing so many painful things to happen. I know that God is with us all the time and that He wants everyone to experience Him supernaturally, and there have been times in my life when I’ve seen miracle after miracle. But there have also been times when He seemed slow to act, and let us go so close to the edge that it felt like we’d fall off! When God allows hardship and suffering there is a purpose behind it, He’s training us. It deepens our relationship with Him, helps us to grow as overcomers, and increases our faith. We need to grow, and mature, and trust God, even when we don’t see miracles, and even when it doesn’t look as though He’s answering our prayers. We are called to overcome and to stand in faith, trusting that God is who He says He is, and does what He says He will do. I regularly pray that God will be very real to me today, and that I won’t be operating out of head knowledge. I ask, “Lord, let me see You in practical ways.” And I ask Him to use me to help people along my way. When I do this I usually have God encounters with people in public places, and online. If you want to experience God in this way, simply ask Him to make himself real to you. Ask Him to surprise you with something that you will know is from him. Ask Him to surprise you with His goodness, and timely intervention. Pray daily, and ask God to speak to you about your situation and for people around you. Write down things that you hear God say and record the things you experience. Share these things with other people to encourage them too. If you’d like to learn how to walk more closely with the Lord and have daily conversations with Him, I encourage you to read the book that the Lord led me to write for you, you’ll find lots of help and encouragement there. 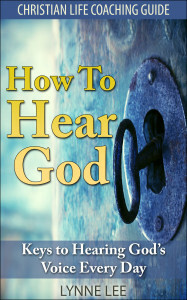 It is available through Amazon worldwide. By the way, if you want to be equipped to help people more effectively and transform your own life in the process, I highly recommend you take a look at our Christian life coach training. It isn’t just for people who want to set up in business as a life coach. The people who train with me come from all walks of life…from stay at home mums to consultant psychiatrists! Age needn’t be a barrier. If you think this training might be just what you need to equip you to help people have breakthroughs, you’ll find the details here. I have a class starting on Tuesday. or chastisement to reign me into His will so I can be blessed. I pray that I come thru with more faith and trust in Him. Thank you for your encouragement. Is there any way I can help you be bale to take the class? Maybe you could message me with how much you could afford to pay each month and I’ll do my best to sort out something that works.